Rock-bottom mortgage rates moved even lower this week, hitting 4.12% for a 30-year fixed rate loan, according to Freddie Mac. 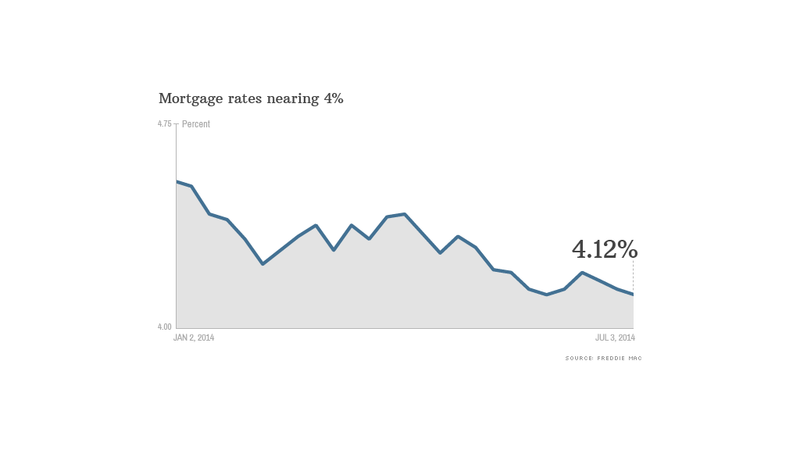 The last time the 30-year rate was lower was in October, 2013 when it stood at 4.10%. The rate on 15-year loans remained at 3.22%. The fact that borrowing remains so affordable has surprised experts, who expected rates to start rising once the Federal Reserve began to cut back on its purchases of Treasury bonds and mortgage backed securities. The Fed began to pull back its bond buying last December, but mortgage rates fell for much of the first half of the year anyway. "This is more remarkable with the economy coming back up to speed and a bit more inflation pressure than we've seen for a while," said Keith Gumbinger, vice president of HSH.com, a mortgage information company. Low rates mean lower monthly payments for homebuyers. Payments on a $200,000 loan at 4% come to just $955 a month, while the same loan at 5% would cost $1,073 a month and $1,200 at a rate of 6%. And indeed, recent housing market data has improved. In May, existing home sales climbed nearly 5% in May and new home sales jumped 19%. Nobody knows when rates will start to climb, said Gumbinger, so homebuyers are seizing their chance to lock in near-record low rates as fast as they can.